Thank you to Tiny Prints for partnering with me on this post for our 2015 Christmas cards and goodies. There’s just something about getting a card in the mail that brightens your day, especially when it’s from someone you love and you can put it on display. Christmas cards are one of my favorite things about the holidays. When December rolls around, I eagerly check the mailbox each day to see if we’ve received any. This year is extra special for us because we have a new member of our family, our son, Rohen. It’s his first Christmas and our first Christmas card as a family of four. 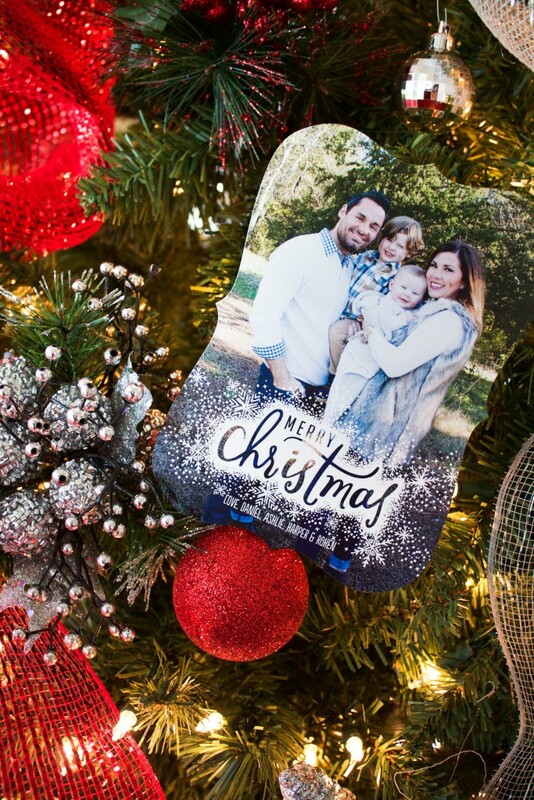 So, of course Tiny Prints was my first choice in finding the perfect card to send to our family and friends! 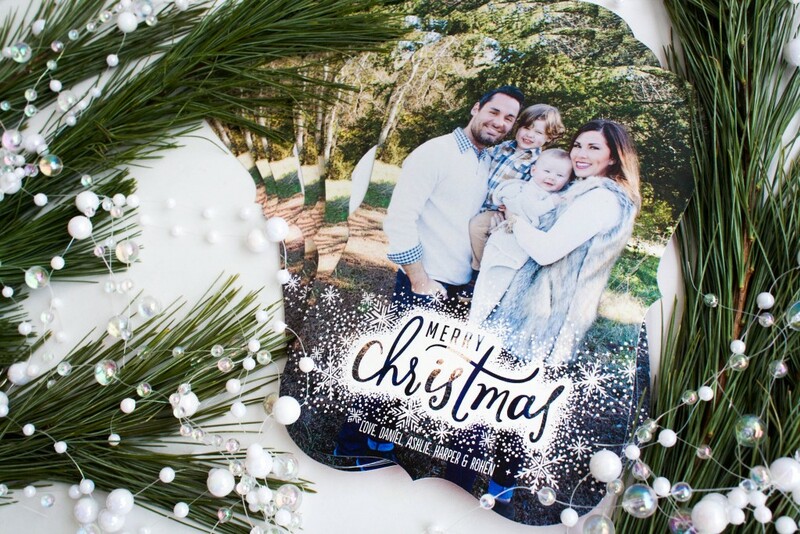 This year I chose a Christmas card that was foil stamped and I love the look of it! I just feel like it adds so much to the card. They were all beautiful, which made it so hard to decide on one. 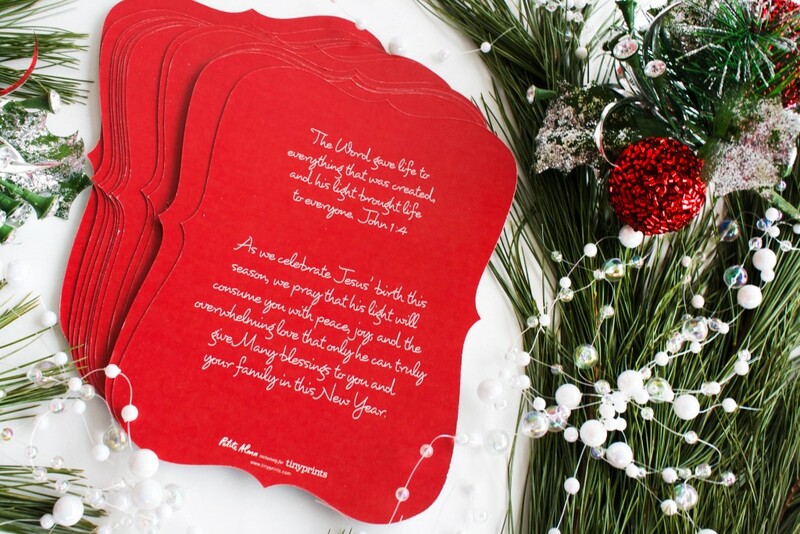 We picked the Stenciled in Snow Holiday Card with a festive red envelope liner. I couldn’t have been more happy when I got it all in the mail! We have family and friends all over the world, so to be able to send Christmas cards to them feels like we’re sending them a little piece of us. Which is wonderful for when you have those you love who don’t live close. The holidays can easily become chaotic! 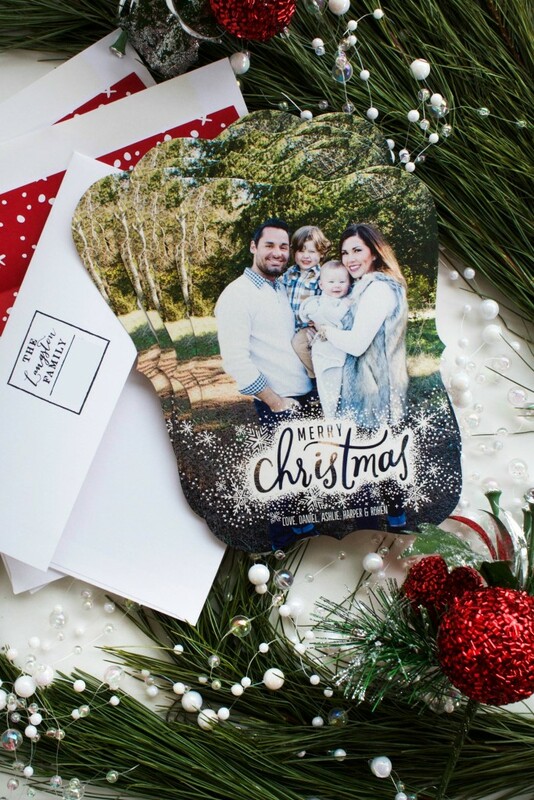 So, when you find a company who not only has beautiful Christmas cards, but also has other things to make your life easier, it’s a no brainer to keep coming back. I ordered a return address stamp and adorable personalized postage stamps. Now I have everything I need to get the cards in the mail without spending extra time buying postage or writing return addresses on every envelope! Now that we have children, we’re creating traditions for our family and it’s so fun. This year is already so different with Harper, who is now almost three. It’s amazing how much one year can change things in the life of child. He’s really enjoying everything so much more than last year and is wanting to help with practically everything, especially picking out gifts for family. He helped me go through and pick out something special little for everyone. There are endless options! 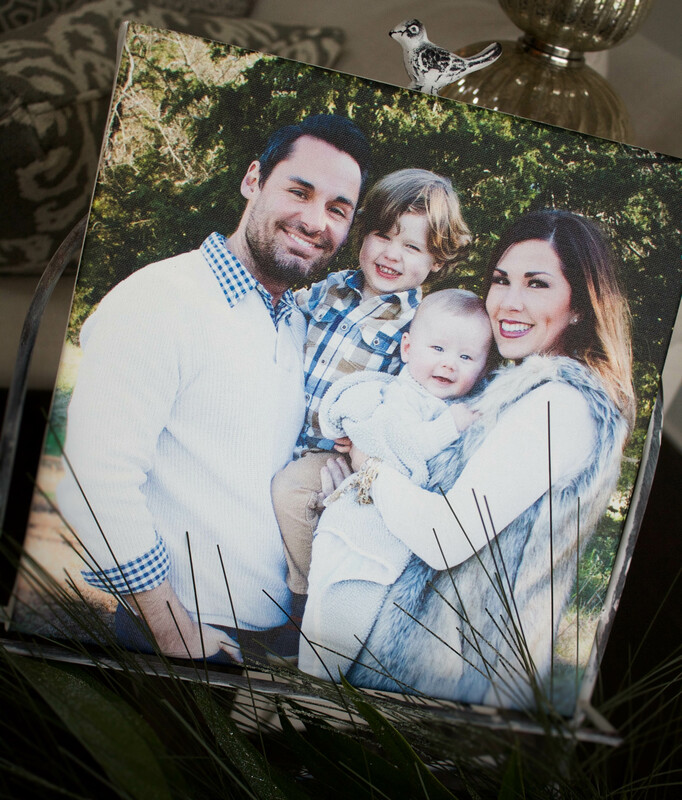 We chose some fun magnets and these amazing canvas prints! It will be so fun to see his grandparents open them knowing he helped. I’m so in love with how everything turned out and how we were able to capture this year of our life perfectly! 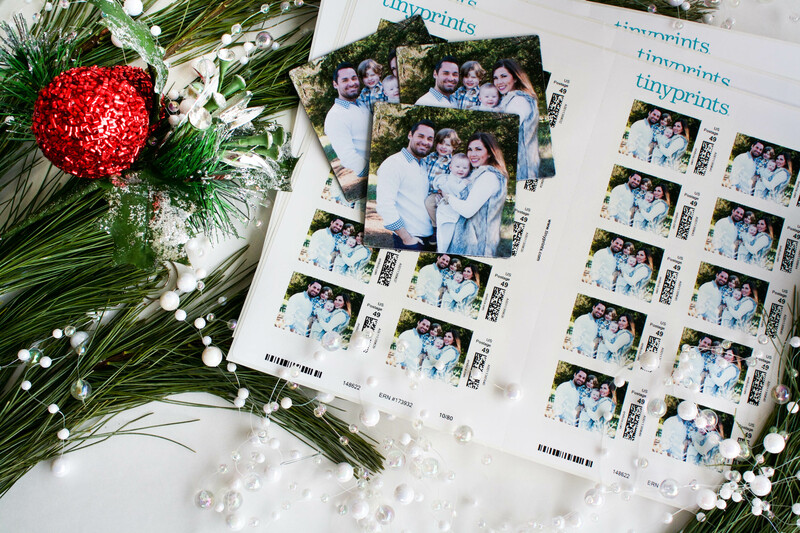 Thank you Tiny Prints for helping us do that and spread it out to those we love. Merry Christmas, everyone! I hope your holidays are filled with abundant love and blessings as you end this year! Thanks, friend! :) You should get it this week!